Sorry for the delay in announcing the winner this month, the event round up was posted a long time back but was not complete and since I was traveling could not contact the host to update it. Now, that it’s updated I’m announcing the winner. No.5 is of Chandrani’s Balep Korkun. Congrats Chandrani, you get a cookbook from Tarla Dalal once you confirm via email, in which way you publicly follow my blog. As is always mentioned that the book can be won only by the followers of my blog. Please contact me at cookingoodfood@gmail.com within 48hrs. In case you fail to respond back, I will have to pick another winner. Coming to the next month’s theme, it’s an all time favorite food; Sandwiches with the addition of Burgers and Panini too. The event is guest hosted by Sushma from Savi-Ruchi. The details of the event can be checked in her blog tomorrow. 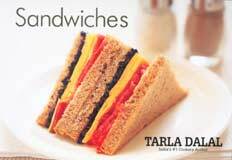 The giveaway cookbook for the winner of the event is sponsored by www.tarladalal.com. So, try innovative fillings and send loads of recipes to the event. Good Luck. Thanks pari..I am very happy to winning this giveaway.